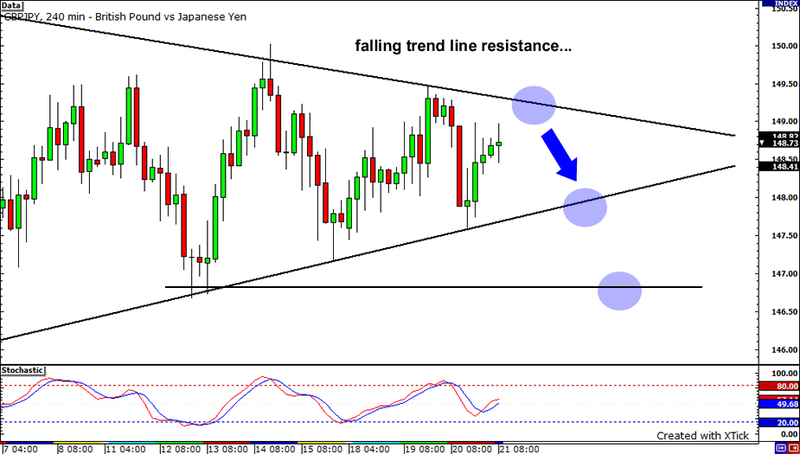 The GBPJPY pair broke down from the symmetrical triangle formation yesterday and plummeted to the 145.50 area. Before doing so, the pair climbed to retest the top of the triangle but, unfortunately, it missed my entry order by a few pips. Argh! That would’ve been a nice, quick, and very profitable trade. Apparently, UK’s public sector net borrowing report highlighted the nation’s weak fiscal situation. Their public sector net borrowing was at 15.7 billion GBP in December, bringing the UK’s total borrowing for 2009 to 142.6 billion GBP – its highest level since 1946! Furthermore, risk aversion was in full force yesterday, which helped the USD and JPY post decent gains across the board. Hey everyone! 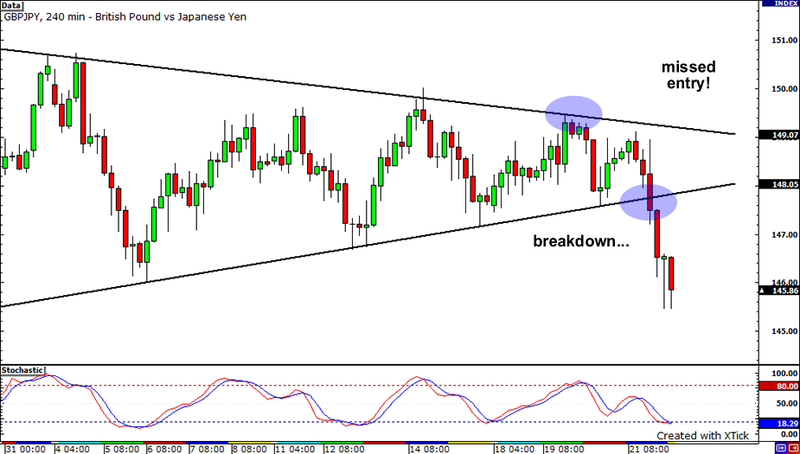 Well, I’ve been scanning the yen crosses and came across the GBPJPY’s 4-hour chart. Good God… I spotted a humongous symmetrical triangle formation! Finally, here’s a chance for me to pocket them pips! The pair is currently climbing towards the top of the triangle, probably to retest the resistance around 149.00 to 149.20. I’m hoping to short at the top of the triangle and take profits off at the bottom of the symmetric triangle. I also set another profit target at 146.00, which seems to be next support level in sight, in case the pair goes for a breakout to the downside. I’ll place my stop a few pips above the previous week high, just above the psychological 150.00 handle. Looking at the BabyPips.com’s economic calendar, there doesn’t seem to be much reports that will cause a ruckus in the markets. The CBI industrial orders expectations is on deck but is expected once again to post a decline in the index, with a score of -39. If the reading comes in worse than expected, it could actually spur some pound selling as it would indicate that industrial orders are still unstable. Furthermore, I’m keeping my eye out for any more news out of China. The markets reacted sharply to news that the Chinese government would cut back on its lending in order to prevent growth. We saw risk aversion take over once this news hit the market, spurring the dollar and yen to big gains. If we hear more rumblings out of China, we may just see this market move continue today.